The DIY Doctor Team are now back in the office after another successful weekend at the Homebuilding and Renovating Show held at Sandown Park in Surrey. 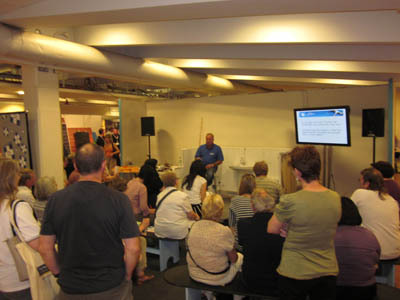 As we have found at previous events, the seminars by DIY Doctor Mike Edwards on the Tricks of the Trade stage were very well attended. Mike spent some time answering questions from the audience and signing copies of his latest book ‘Master Basic DIY’ after each of his presentations. The ‘How to Avoid Cowboy Builders’ was very popular on both days, and we have already received many requests for our Desired Outcome Contract. Click through here to get your copy. We really enjoyed meeting so many of our users and hearing about the home improvements you have been tackling – do keep in touch and let us know how your projects went! We would like to thank all the visitors for their comments and feedback during the show. If you missed us this time, don’t worry! DIY Doctor will be at the National Home Improvement Show to be held at Earl’s Court at the end of September. More details will follow closer to the actual event so keep an eye on our blog and Newspages for more information.